The Holy Virgin was so obedient to the will of God, that having heard from the Archangel regarding her forthcoming service she meekly replied: “Behold the handmaiden of the Lord.” The Holy Virgin Mary was so obedient to the will of God, that having heard from the elder Simeon of the future painful agony to which her heart would be subjected, she humbly accepted her share in the suffering on the cross of her Son and God. (Luke 2:25-35) With these three qualities – humility, obedience, and purity of nature – our creator showed us the highest example of what we humans can be like, of what we should be like, and of how the Creator intended us to be. 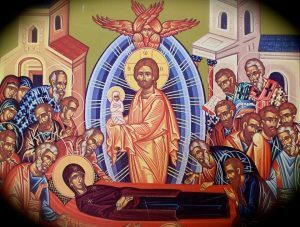 In this great Feast of the Church and in the Dormition Icon we celebrate a fundamental teaching of our faith, the Resurrection of the body. 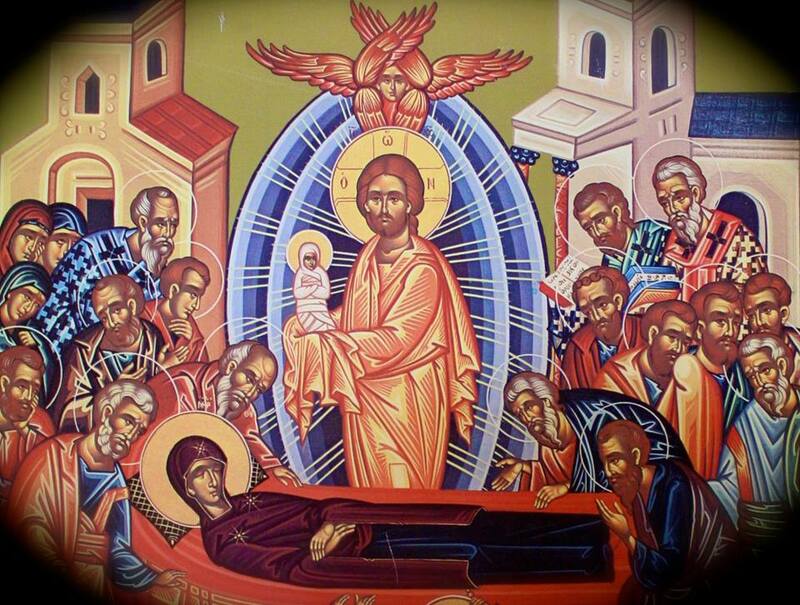 In the case of the Theotokos, this has been accomplished by the divine will of God. This Feast is a feast of great hope, hope in Resurrection and life eternal. And like those who gathered around the body of the Virgin Mary, we gather around our departed loved ones and commend their souls into the hands of Christ. As we remember those who have reposed in the faith before us and have passed on into the communion of the Saints, we prepare ourselves to one day be received into the new life of the age to come and into a life without end. Pray to God for us unworthy ones oh compassionate one! Glory to Thee!